Mudras mean hand-postures. 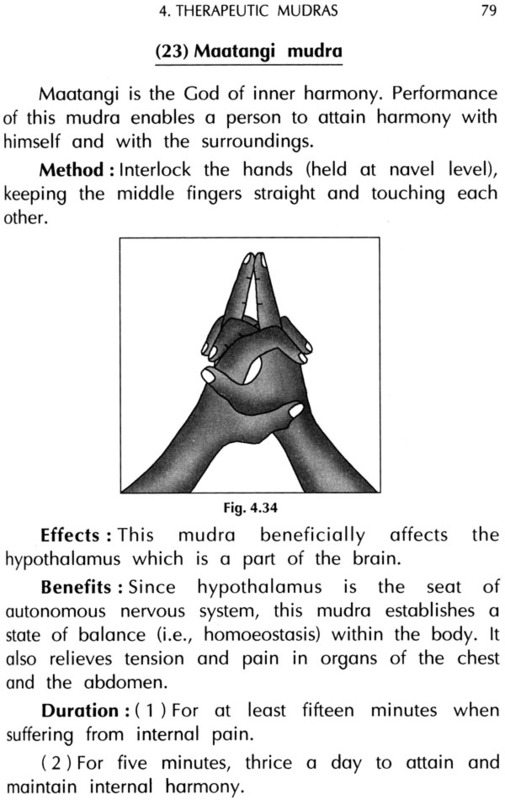 In Mudra Therapy, diseases are treated through specific hand-postures, i.e. simply by holding thumbs and fingers in particular ways for a few minutes everyday. 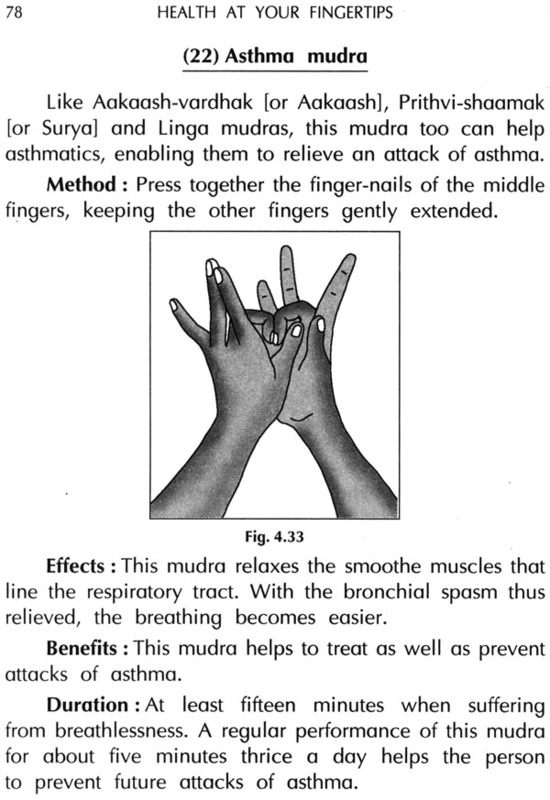 ‘Why do we need Mudra Therapy when effective medical treatments are available?’, you might rightly ask. Over answer is: Indeed, medicines are useful and effective. They are, really, a boon to mankind. But, they are expensive. They, frequently, produce side-effects. 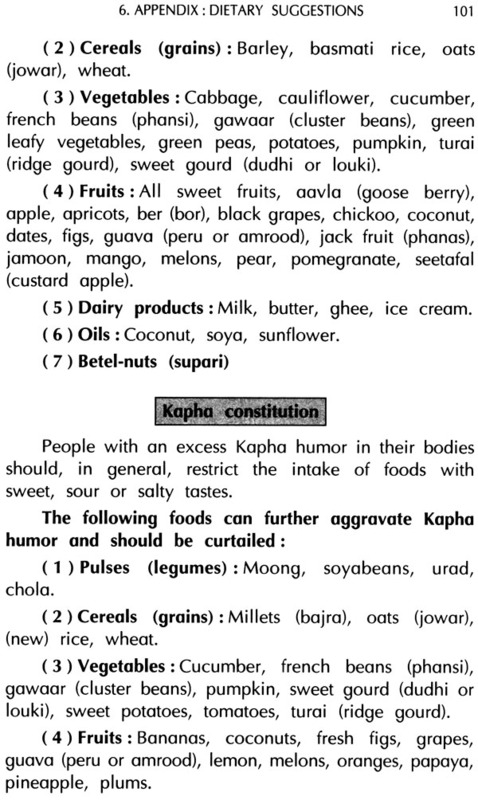 There is, also, the appalling problem of spurious or adulterated medicines. Will it not be more logical to tackle common, minor diseases through some form of treatment which does not necessitate the use of medicines? Mudra Therapy is one such form of treatment. Very simple; even a child can learn/do it. Entirely safe; no side-effects whatsoever. Inexpensive; in fact, free of cost. Quite effective; sometimes relief (e.g., from ear-pain of chest pain) is obtained within minutes of performing a mudra. Dr. Dhiren Gala is a registered medical doctor practising holistic medicine, effectively combining the positive features of Homoeopathy, Acupressure/Acupuncture, Naturopathy, Magnet Therapy, Reiki Therapy, etc. He has worked as a lecturer in visual sciences at the prestigious College of Optometry, Municipal Eye Hospital, Mumbai. He has lectured on a variety of subjects (e.g., Eye-care, Acupressure, Magnet Therapy, Homoeopathy, etc.) at seminars organized by various institutions all over the country. The co-author of this book, Dr. Dhanlal Gala is a qualified Naturopathic physician. He has over thirty years’ experience in treating chronic diseases through non-medicinal measures such as dietary changes, exercises and yogasanas. Welcome to the world of Hasta-mudras or hand-postures. Till now, you had witnessed the use of mudras in various Indian classical dances and in religious ceremonies. 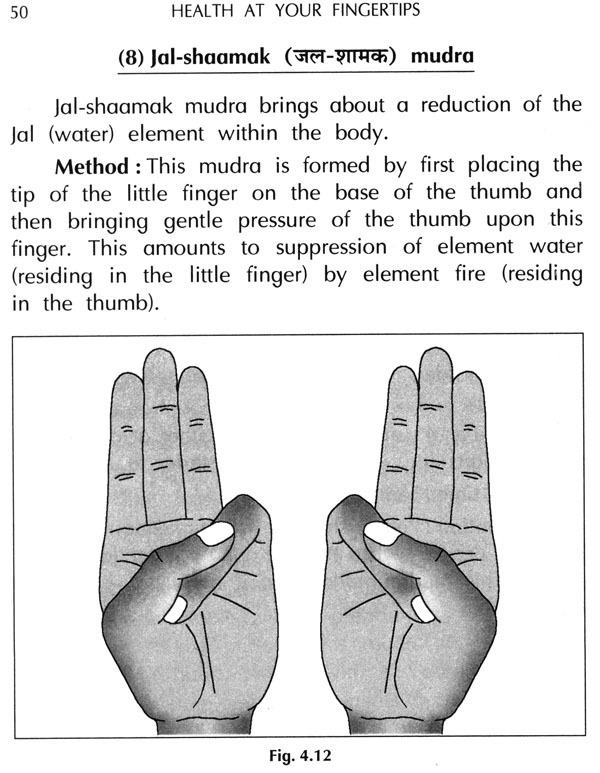 However, mudras can be put to therapeutic use as well. This book will precisely tell you how mudras can be employed to overcome ailments, physical as well as mental, and regain true well-being. Mudras enjoy a preventive aspect, too. This book will also tell you how you can avert illness and maintain peak health by practising certain mudras everyday while watching Television! 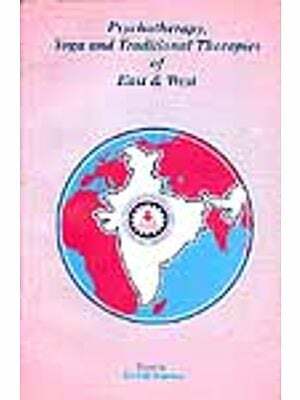 A number of books on Mudra Therapy are already available in the market. But none describes the rationale behind Mudra Therapy. No book explains why a particular mudra helps a particular ailment. 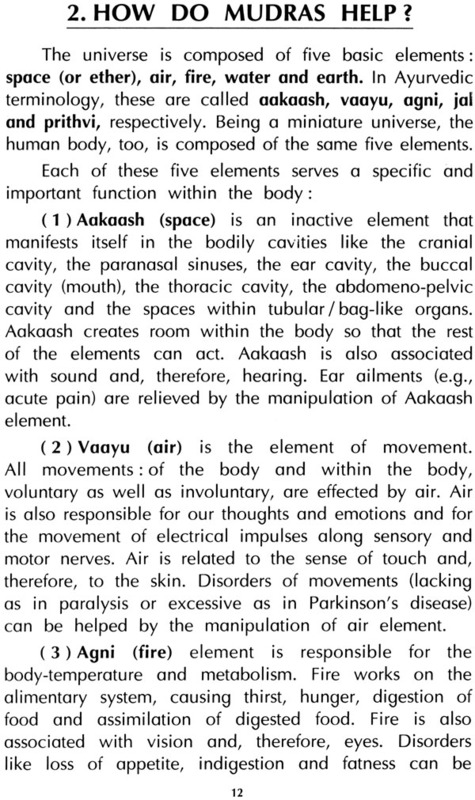 In other words, no book describes the science of Mudra Therapy. It is for this reason that this excellent Therapy has not found favour with doctors and scientists. This book, for the first time, humbly attempts to throw light upon the mechanism of action of mudras. However, very little is gained just by reading a book. We earnestly request you to put this knowledge to use. 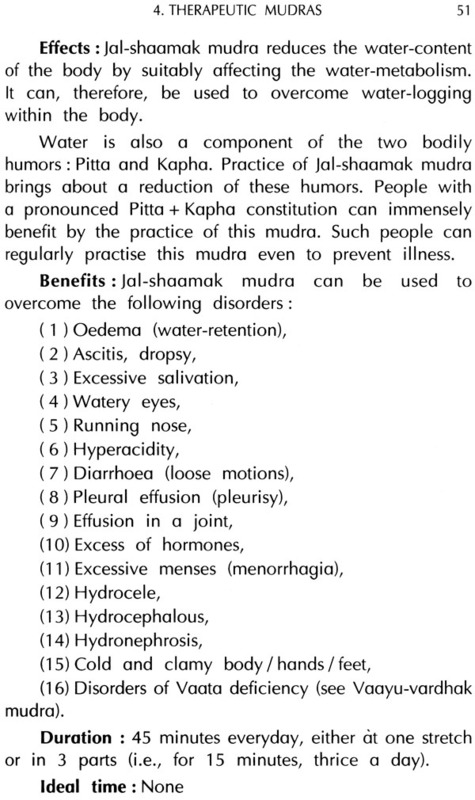 Whenever you (or your family members) suffer from a snot so serious’ ailment, think of mudra(s), rather than medicine(s); practise them diligently. And mudras will seldom disappoint you. More often than not, you will succeed in driving the disease away. However, we do not want people to believe that in Mudra Therapy they have found a substitute for a competent physician. 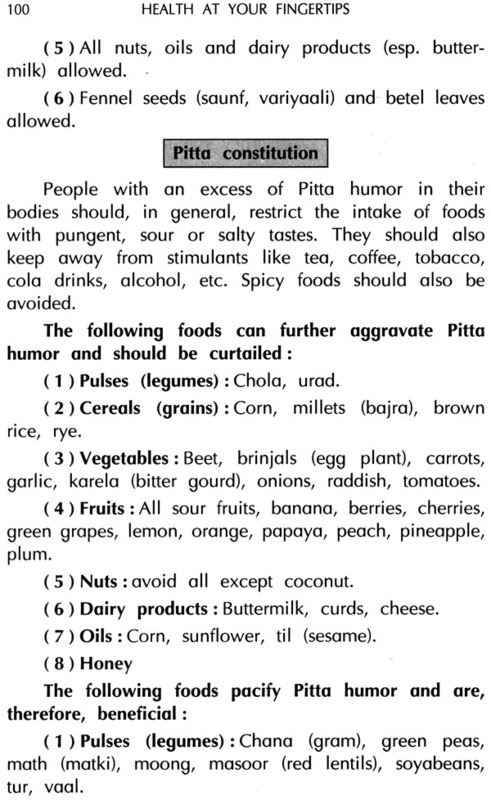 If a disease persists or seems to be getting worse even after a religious practice of mudra(s) for a week or two, the family- doctor should be consulted. Suggestions for the improvement of this book are solicited and shall be sincerely considered while bringing out the next edition of this book. Medicines are, indeed, a boon to mankind! At times, medicines even save lives. Diseases once believed to be incurable (e.g., tuberculosis) have been completely tamed by medicines and rendered as docile as the proverbial cow. Effective vaccines have eradicated many viral diseases (e.g., small pox) from the surface of the earth. (1) At times medicines only mask symptoms or merely relieve distress, rather than striking at the root causes of illness. Many doctors are inwardly aware of the fact (though- they may not admit it openly) that symptoms represent, not a disease but our immunity and, therefore, should never be suppressed. (2) Medicines are like double-edged swords; they can help but they can harm as well. To put it in popular parlance, medicines often produce unintended or undesirable 'side-effects'. It has happened time and again that medicines declared absolutely safe by the pharmaceutical industry, on the basis of the much- boasted 'double-blind clinical trials', were later found to produce very serious side-effects. Let us cite the example of Thalidomide. Hundreds of pregnant women who took this supposedly harmless sleeping pill gave birth to babies with malformed (seal) limbs. 'Dr. Dale Friend, the head of the pharmacology department of the renowned Britham Hospital in Boston, Mass., USA, says unequivocally, 'there is nothing like a safe medicine'. (3) Modern medicines are too powerful weapons to be used against trivial diseases; it is like using a cannon-ball to kill a fly! (4) After the advent of specialist / super-specialist, doctors, five-star hospitals and sophisticated, hi-tech diagnostic instruments, medical treatment has become prohibitively expensive; only the most affluent can easily afford it. God save the poor or the middle-class man who falls ill. All of us have seen families brought to ruin by enormous medical expenses. (5) Because of the 'not-so-stringent' laws and inefficient (in effect, non-existent) judicial systems, most developing countries are witnessing the appalling problem of adulterated or fake medicines. When buying / receiving a medicine, many a time we wonder whether the capsules contain the 'real thing' or merely sawdust! (6) It, almost always, happens that our body and/ or the germs soon get accustomed or resistant to a particular medicine. When the era of antibiotics dawned with the invention of penicillin by Alexander Fleming, it was believed that all infectious diseases will soon be eradicated from the surface of the earth. That dream, however, has been reduced to shambles. The stark truth is that disease-causing germs soon learn to digest antibiotic toxins. Malarial parasites are, no longer responding to the once infallible chloroquin and malaria is making a spirited comeback throughout the world. There are two more issues that need further elucidation. Firstly, there are diseases for which satisfactory medical solutions have not yet been discovered. 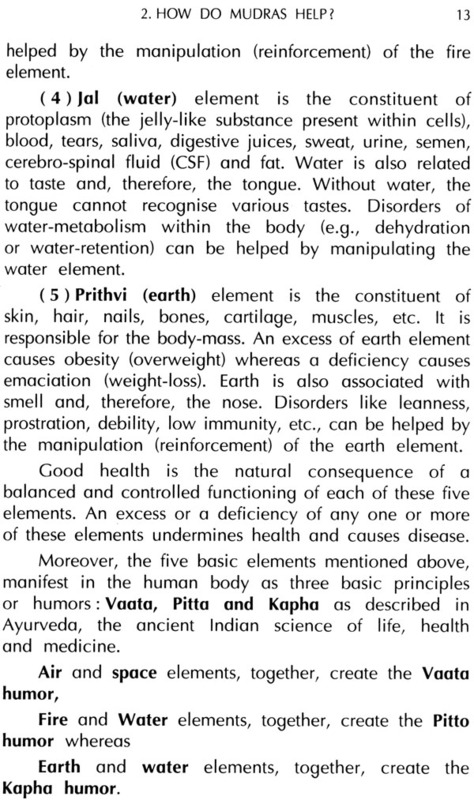 Secondly, there are diseases like diabetes, high blood pressure, etc., which can only be controlled but not cured. Such diseases call for life-long treatment to prevent further deterioration of health and sustain life. Considering the possibilities of adverse side-effects, few people suffering from such diseases would relish the idea of taking medicines throughout life. Any rational person, who carefully considers these drawbacks of medicines, would have no hesitation in admitting that it would be more logical to tackle diseases through non-medical measures. But is it possible? Can diseases be actually 'cured' without resorting to medicines? In reply, we will say that there are, indeed, effective non-medicinal therapeutic measures (like Acupuncture, Acupressure*, Naturopathy*, Magnet Therapy*, Reiki Therapy*, etc.) that can be employed to fight diseases. The history of healing is much older than the history of medicine! We sincerely believe that people should be informed about, and trained in, a few non-medicinal yet effective modes of treatment so that they can treat the 'not so serious' common ailments on their own, at home. Of course, if such non-medicinal 'first line of treatment' proves inadequate, a competent physician should certainly be consulted.